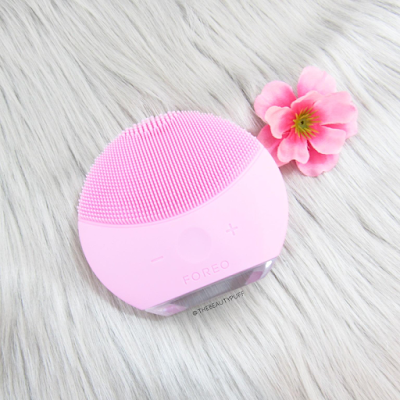 Many people are familiar with the Foreo brand for creating versatile and unique cleansing devices within their Luna line. With different colors and models to choose from, there's a style for everyone that is sure to change your skincare routine forever. 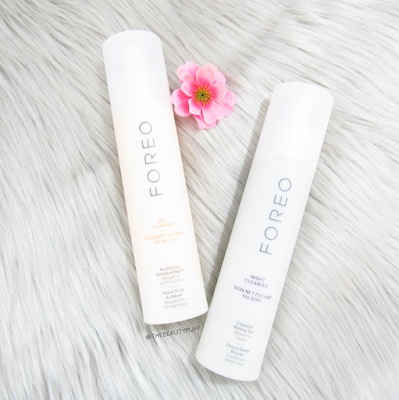 Now, Foreo has released their own line of cleansers - one for day and one for night. These cleansers work in conjunction with the Luna devices to provide the ultimate facial cleansing experience. I would be remiss if I didn't first focus on my Luna Mini 2. This device is optimized with three different texture zones and eight intensities so you can find the right combination for your skin. The front has thin touch-points that are incredibly soft and perfect for everyday cleansing. The tip has thicker, more precise touch-points to get in hard-to-reach places like around your nose. The back has broad touch-points that are ideal for more oily areas, like your t-zone. Fully charge your Luna device with the included power cord. Charging only takes about an hour. To use, apply cleanser to dry face, dampen Luna device and choose your desired intensity. Move the device in circular motions around your face and continue for one minute. Dampening your Luna device again will help create more foam from the cleanser. Rinse and dry your face and continue with your skincare routine. This cleanser has a light citrus scent that's refreshing to wake up to in the morning. It has the texture of a thin yogurt that forms a light lather on the skin. I love how it gently cleanses and leaves my skin silky even before I put my moisturizer on. This cleanser has a slightly sweet, yet calming fragrance. You can see flecks of the meteorite powder within the silky gel that works into a soothing foam. My skin gets an amazing deep down clean from this cleanser that truly gets rid of all the dirt of the day. I have been using the Foreo Luna Mini 2 and these new cleansers exclusively for the past few weeks. I noticed a huge difference in my skin within just a couple days with this regimen! My skin looked brighter, healthier, and clearer. My moisturizers have absorbed much better and my makeup looks much fresher on my skin. Afterall, a clean, smooth canvas is ideal for makeup application. I can't believe how my skin has improved with this one simple change. Even the pores around my nose are less visible, I love that! Now I can use even lighter coverage foundation without worry of how my skin looks. I don't think I could ever go back to typical cleansing again! And the best part is, the Foreo devices are easy to sanitize and never require replacement brushes. It's such a worthwhile investment, I can't recommend this cleansing system enough! You can find the Foreo Luna devices as well as their new cleansers on their website below!